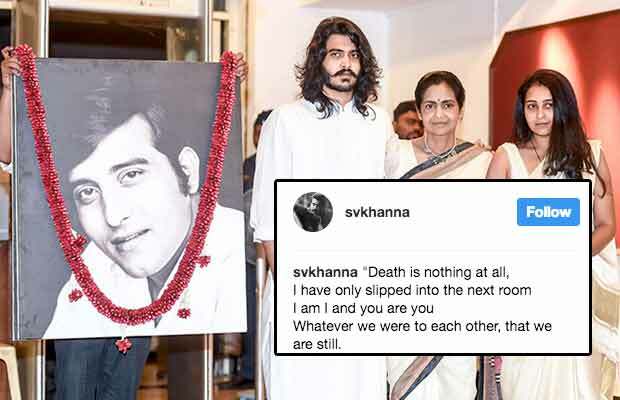 Vinod Khanna’s Son Sakshi Khanna Gets Emotional, Writes A Heartfelt Note On His Late Father’s Birthday! It is late veteran actor Vinod Khanna’s birthday today, on which his son Sakshi Khanna has dedicated a note to him! The entire Indian cinema, as well as the fans, were shaken with the news of the death of veteran actor Vinod Khanna. The actor, who had an incredible journey in the industry, passed away this year on the morning of April 27, at the age of 70 after a prolonged illness. It is the late actor’s birthday today. Had he been alive he would have turned 71 today. To celebrate the special day, the legend’s son Sakshi Khanna dedicated a heartfelt note to him. Sakshi took to Instagram to share a special message for his dad. And along with the message, he shared an old picture of himself with his father. Previous articleHrithik Roshan’s Spokesperson Answers Rangoli And Kangana Ranaut’s Representatives’ Questions!